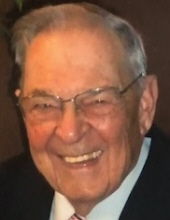 Henry F. Gosciniak, age 94, a resident of Naperville, IL since 1997, formerly of Chicago, IL, passed away on Saturday, January 26, 2019 at Seasons Hospice Home in Naperville. He was born December 31, 1924 in Chicago, IL. Beloved husband of Frieda J. Gosciniak (nee Kulinski), whom he married July 11, 1959, loving father of John (Gayle) Gosciniak of Naperville and Renee (Mark) Dworkin of Wheaton, IL, adored grandfather of John "Jay" and Patrick Gosciniak; Josie and Julieanne Dworkin, devoted son of the late Francis and Josephine (nee Buchholz) Gosciniak, dear brother of the late Marion, Casimir and Regina "Reggie", fond uncle, great-uncle and friend of many. Henry grew up on Chicago's North Side, attended St. Helen's Catholic Church and was a 1943 graduate of Crane High School. He served in the U.S. Navy during World War II, in the Pacific Theater, aboard the Minesweeper YMS-286 and again during the Korean War aboard the USS Navarro. Henry worked for many years as an operating engineer with the Metropolitan Water Reclamation District of Greater Chicago. Henry was a former member of St. Stanislaus Bishop and Martyr Parish, Chicago and the Holy Name Society. After settling in Naperville, Henry became a member of St. Thomas the Apostle Catholic Church. He was a 4th degree member of the Knights of Columbus, Lafayette Council #361, Chicago and enjoyed fishing, gardening, doing handyman work and most of all, spending time with his family. Visitation Thursday, January 31, 2019, 9:30-10:45 AM in the narthex at St. Thomas the Apostle Catholic Church, 1500 Brookdale Rd., Naperville. A Mass of Christian Burial will follow Thursday, 11:00 AM in the church. To send flowers or a remembrance gift to the family of Henry F. Gosciniak, please visit our Tribute Store. "Email Address" would like to share the life celebration of Henry F. Gosciniak. Click on the "link" to go to share a favorite memory or leave a condolence message for the family.